Everything about them - the smoothness, the neatness, the snugness - I love. I especially love how they make the armscye so ungaping. When I first started sewing them as a teenager, I wanted to put them in every garment I made - bustiers, spaghetti strap sundresses, gowns, everything. It drove my mother crazy. Drafting them from a regular french-dart sloper, though, was not as straightforwardly Let's-Slash-And-Pivot-The-Old-Dart as the drafting books say it is. There's a lot of fit-refining to do, even up to the shoulder seam. I took in so much almost everywhere that I eventually redrafted the whole thing from scratch again. Either I'd forgotten all I ever knew about princess seams and dart rotation, or I've lost some pounds (unlikely, given the vast amounts of snacking I've been doing this summer), or I don't know how to read drafting books. Or maybe I should just stop reading drafting books. Pardon the multitude of creases - we took the photos after a whole day of running after children at a party and- yes, in this dress -playing basketball with them. Weird expression on face - not sure why, but I do this a lot in photos. I suspect my most current sloper - the one made in March - is already out of date. There is a lot of ease in weird places that I never noticed before. 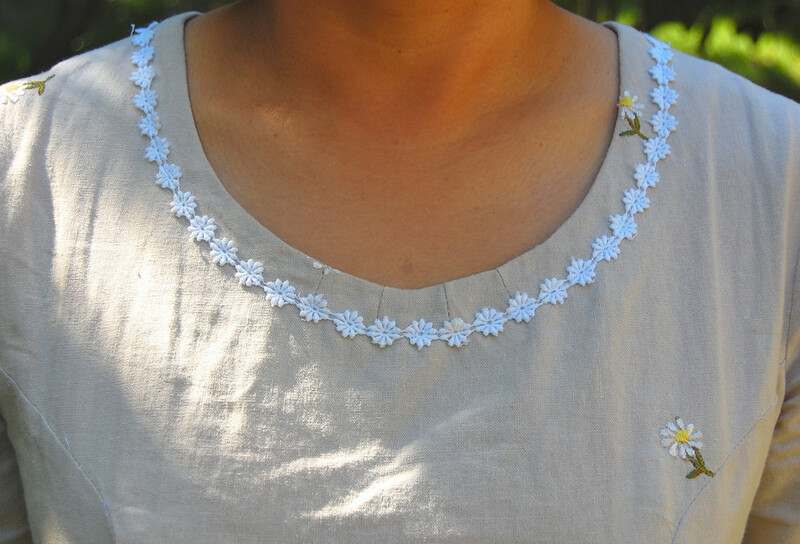 The scoop neckline required 4 pintucks/mini darts to lie flat - despite my being very, very careful in handling it. Shocking, what just a half inch of unwanted ease in the wrong place can look like. The long term goal - apart from revisiting my teenhood princess seam obsession -is to sometime sew a winter coat. With top-stitching. Without horrible shoulder pads. I'll need to move the princess seam up to the shoulder. More fit-adjustments. Ho hum. Maybe next winter. But wanted to introduce princess seams because they are supreme and every garment should have them of their streamlining effect. I mean, even wetsuits and leotards have them, so they must also be aerodynamic. 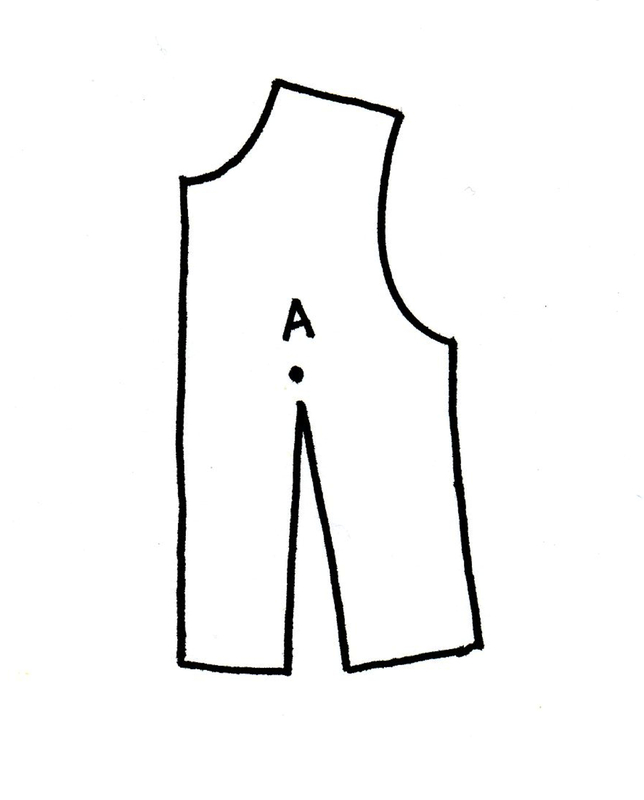 Plus, because they are darts, depending on where they originate on the bodice, they can reduce fullness in particularly effective ways for different body shapes. When they open into the armscye, for instance, they minimize the humiliating, undergarment-revealing gaping sleeveless armholes that plague the more well-endowed among us. And make our waists look oh-so-much-tinier. Am I making sense? Not really? Hm, howzabout we do a mini-tutorial on darts? 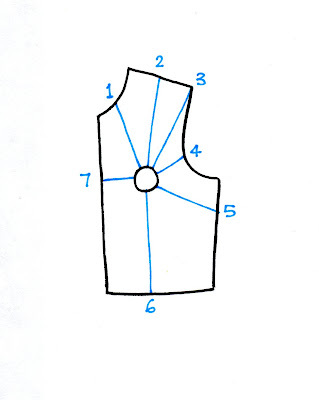 This is a typical dart for a woman's front bodice. 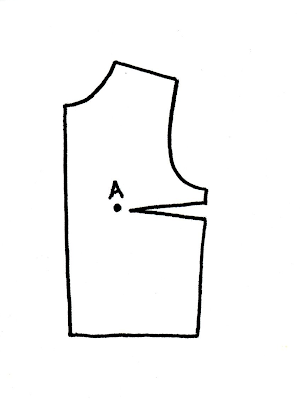 This kind of dart is called a Chest Dart, because that's the area it opens into. Its function is to enhance the bust area by reducing fullness in the hollow regions surrounding the bust - in this case, the side of the chest. Point A is the bust apex. If you remember from our sloper posts, we always plot the point of the dart a short distance away from the actual apex, to avoid over-conical-ness. This is called a Waist Dart, because it opens into the waist. 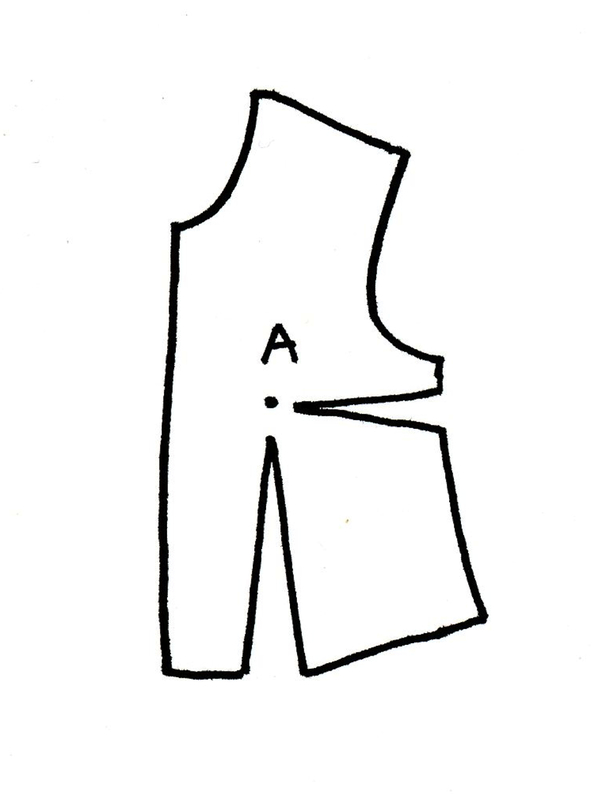 It also shapes the bust but by reducing the fullness in the underbust area. 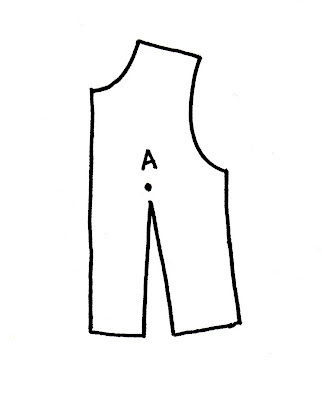 When present in a full-body sloper or pattern, it connects to the waist dart in the bottom half (skirt or trousers). Many commercial patterns have this kind of dart. 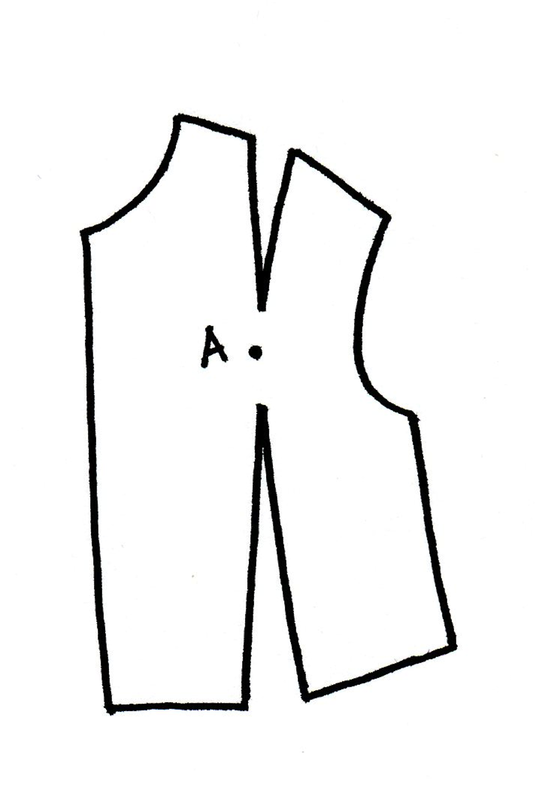 It shows some of the common positions of this front bodice bust-enhancing dart. 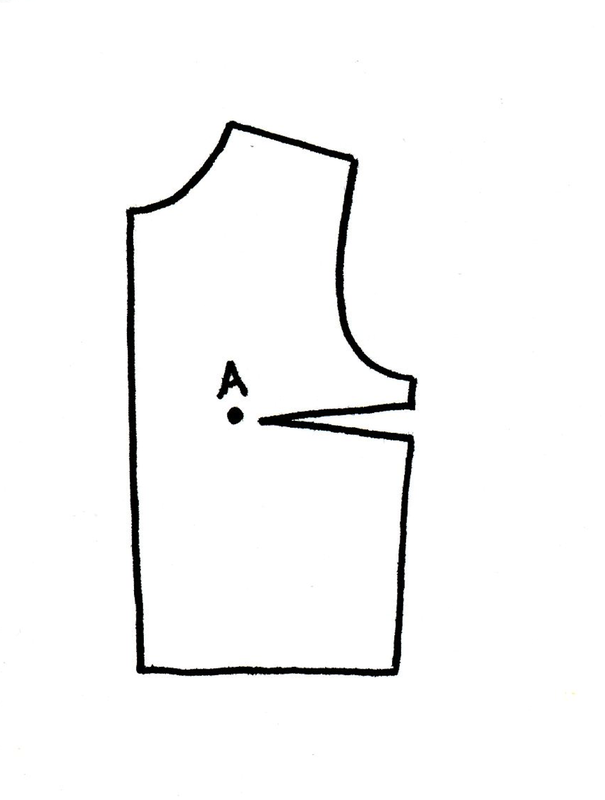 7 = Chest Dart opening into the center front. the print of the material - the dart will interrupt the print. Stripes are especially susceptible to this. the body shape of the person - the dart is usually positioned where it is most flattering. This often means where the body is most hollow. which is especially effective because of its symmetry. I see this a lot on jackets. so you will spend some time shifting the bust apex point, and redrawing the dart and adjusting the armscye and waist and side seam. This is annoying but it is a necessary part of fitting a pattern, so it's all good. Sometimes, you'll want to move the dart to a different position. Maybe you have a favorite pattern whose dart configurations you use without exception on every other pattern. Maybe your body shape is of the sort that favors certain dart positions for modesty and/or vanity. Maybe you're like me and want to make princess seams in everything. Nothing wrong with that. You extend the tip of the dart right to the bust apex. You draw the new dart's position. You cut open the new dart to almost the bust apex point. You close the old dart by rotating the whole pattern about the bust apex. You tape the old dart closed. 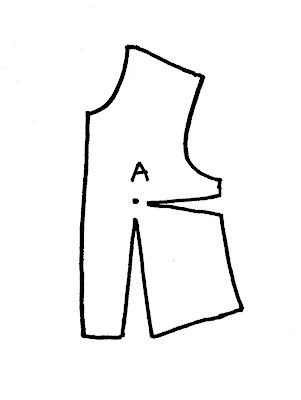 You redraw the side seam/armscye so that the lines are smooth and not pointy. You admire your new dart and feel clever. dance for joy at your superior and incomparably fabulous princess seam pattern. 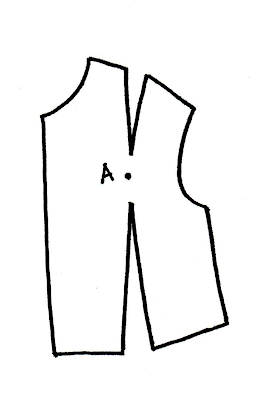 This particular princess seam originates from the armscye but it can also originate elsewhere, like the shoulder (very common in coats) or shoulder point (very common in dressforms). Princess seams are nicest in close-fitting garments. They must run directly over the bust apex or risk looking very daft. So either draft them from scratch or adapt a pattern with zero ease. I've discovered that some companies selling commercial slopers offer two styles - the standard two-dart sloper, and the princess seam sloper. I wonder if it is their interpretation of slopers-with-ease and slopers-without-ease, respectively. And now that I've gone on and on about darts being supreme and the princess seam being the most streamlined of all fullness-reducing darting techniques, let's break the rules and embrace the other extreme - hellooooooo dartlessness! 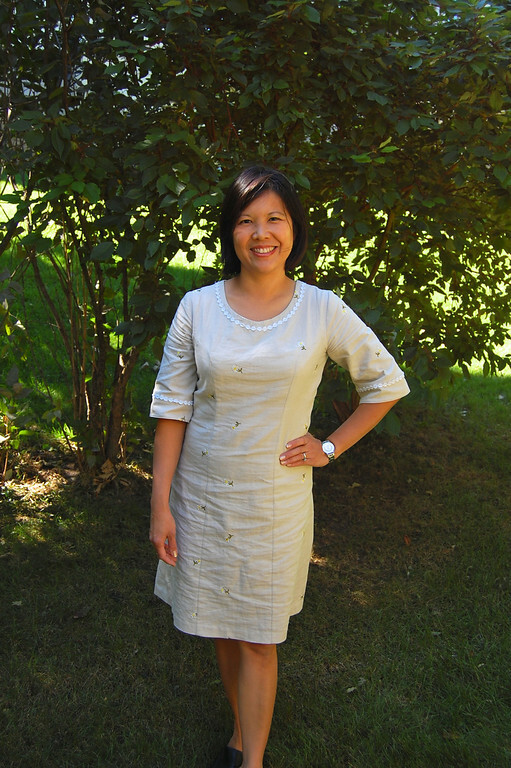 The fit is in the bias drape of the fabric itself and a little bit of waist shaping in the side seams. Easy! And comfortable. And not huggy-clingy like knits. And not tentlike, like one might expect from dartlessness. 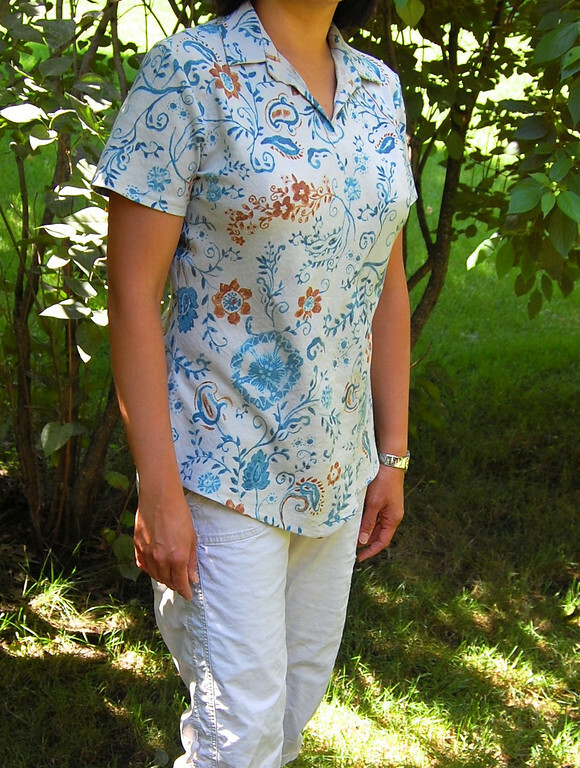 But you'll need to start with either a sloper or a very snug bodice pattern with zero ease. And a good-weight fabric that hangs well and has a good amount of give along the bias, so nothing light like seersucker or quilting cotton or stuff like that. And good foundation garments, so there is actual definition to the bust under all that draping. Well, that was a little deviation from drafting for children. I thought I'd slip this into our series as a follow up to that last post on drafting for boys, men and women. Incidentally, mum hasn't actually seen this princess seam dress yet - she'll probably roll about laughing, knowing that I've reverted to my bad old ways. 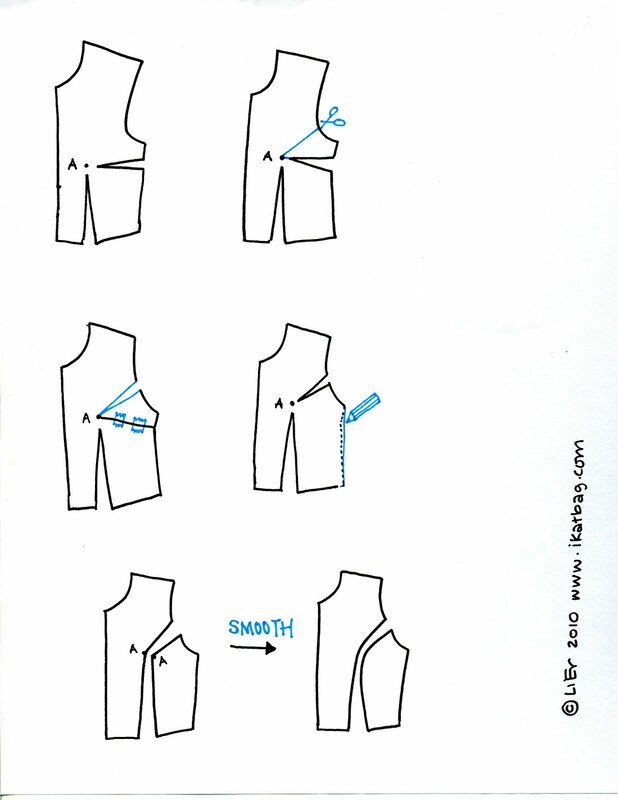 From a newbie sew-er, if you ever make a book out of your great drafting tutorials, I'll be your first customer! These are great! Wow - it's beautiful! I am so envious. I hope that someday, I can become somewhat better at sewing. Very inspirational. Brilliant, I love princess seams as well I think they are so flattering. You've given me so many ideas lately with all your drafting posts that my head is spinning a bit and I'm trying to catch up and actually apply the information. Almost finished the front sloper for eldest daughter just need to complete the armscythe. Its been very rewarding to examine her body and understand how the fabric will drape over her body. Just need to finish and test the draft. If you lived a bit nearer, I'd bake you a cake a week for a year! Great tute, and so timely for me. Just what I needed to know. As I progress my sewing skills, I am going to apply all the these techniques... Thank you! Wow! You look fabulous in that beautiful dress! It's such a perfect fit and I love the details. You SO rock! For taking the mystery out of darts and princess seams, and for playing basketball in your new dress. Thank you so much for this post! I have been learning to draft patterns and your explanations have given me that "lightbulb" moment. Finally, I understand how best to place darts! What a wonderful teacher you are. you suckered me in with that gorgeous dress and that perfect lace - and so I actually tried to wrap my brain around your words and drawings (this is NOT my learning style! can't you come to my house and show me?). And I think I get it. I have always felt so flattered by princess seams, so I think I should aim for them when I finally sew myself a dress (I'm still on skirts). 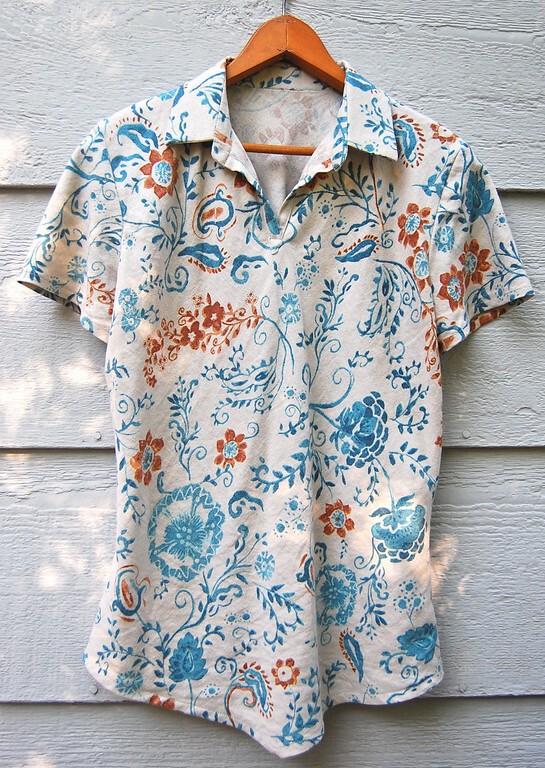 And that dartless shirt - wow. Impressive use of the bias! Whew! That was so fabulous. Really. I'm ready to try both options now. 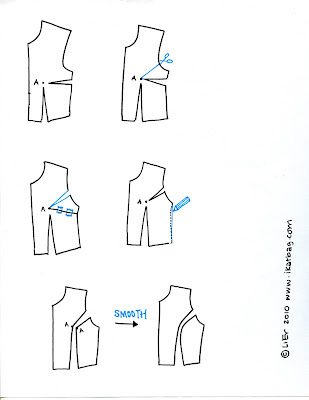 Thank you for this tutorial I have a basic bodice block. I had always wanted to know how to make this adaption. Just as my drafting class was getting to this technique I had to quit :-(. You have now demystified the whole dart rotation and princess seam technique for me. Like wise if you make a e-book I would buy one from you. Wow...I love your sense of humor and your posts! I would love to do this, but I'm so bad at handling darts..they scare me but I intend to study this post and try it..thank you! You reminded me of the brilliance of princess seams! 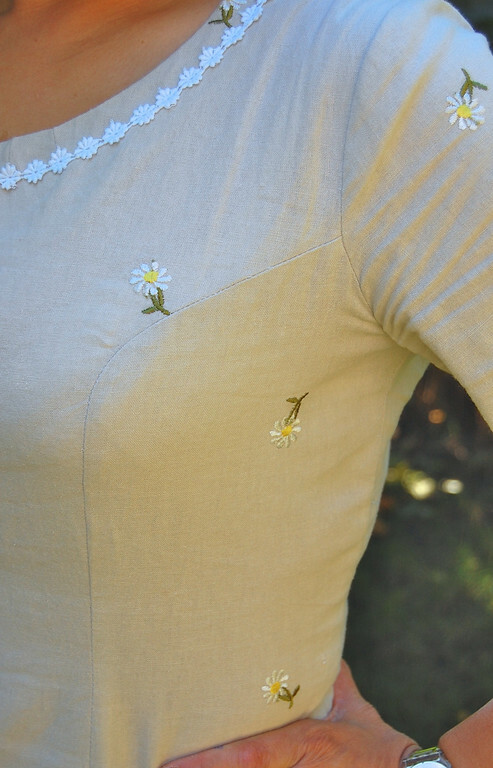 I've linked to this page on my blog at http://thedodosnewclothes.blogspot.co.uk/2012/04/drafting-my-first-pattern.html. I absolutely love your tutorial! Thanks for taking the time to draw all those illustrations. They helped make everything so much clearer. 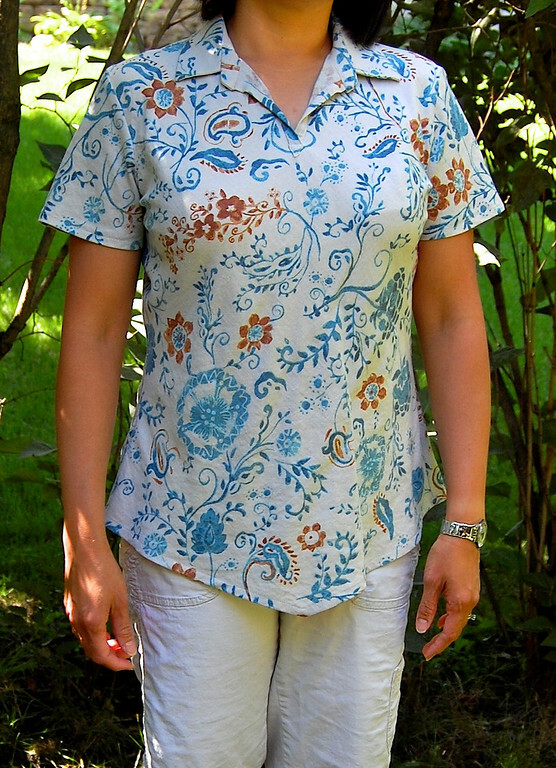 Would you mind sharing what fabric you used for the bias blouse please? That was some kind of linen (possibly linen blend) I got from JoAnn. I don't remember the name. In fact, I don't think I ever knew the name. These are really wonderful posts. My problem is i tried the princess seam and it was so far away from my bust apex. Any advice on how i can make it accurate? 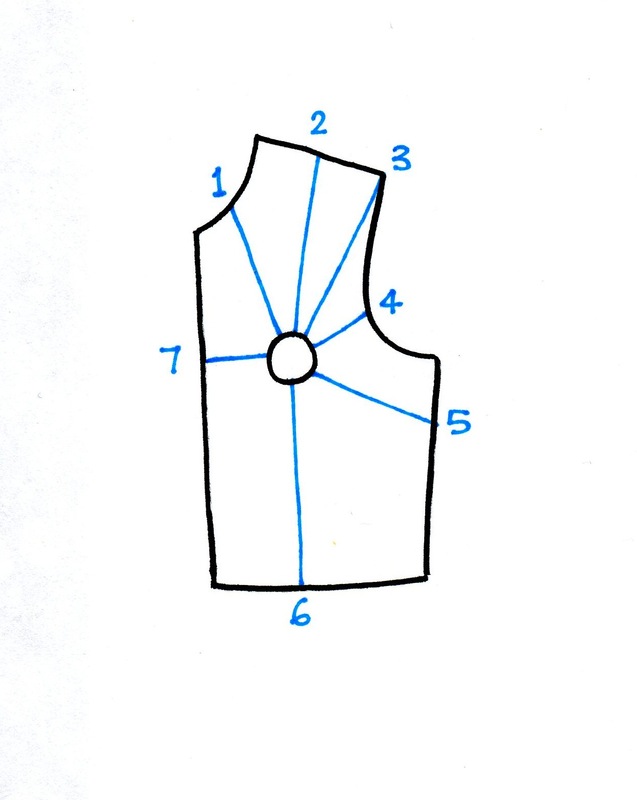 Can you show a picture of the pattern for the bias-cut blouse? Or can anyone who tried this please post it? Thank you! very informative post you have shown here. Thanks. Great Tutorial, except what do you do after cutting through and smoothing the cut for a princess seam? Do you add seam allowance and then attach? hi! thanks so much for this tutorial. do you have any advice for gapping in the front center of my bodice? not sure how to take out the extra inch (yikes!) just in the upper chest. can't find any help in my books or on the web. thanks for any advice!!! I just love your language on this blog. You feel like someone I know! And your tips are fabulous! Can you please share the sleeves pattern for this princess cut dress? Unknown: the sleeve is a classic flare sleeve. Sometimes it is called a bell sleeve, although depending on the fabric used, that can end up being much more ruffled-looking.